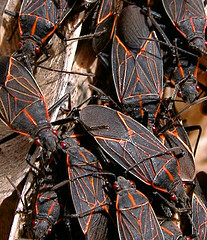 B. rubrolineata adults on Acer negundo (boxelder) in Davis, California. Physical description: Identical to B. trivittata except the veins of the corium are prominent and red in color. B. rubrolineata has been found in Utah, Colorado, and British Columbia, but the exact locations of where it was collected are not known. Aldrich, J.R., Carroll, S.P., Oliver, J.E., et al. (1990) Exocrine secretions of scentless plant bugs: Jadera, Boisea and Niesthrea species. Biochemical Systematics and Ecology, 18, 369-376.